William Kenefick Jones, 81, a retired Marine Corps lieutenant general and a highly decorated veteran of three wars, died April 15, 1998 at the Integrated Health System center in Alexandria, Virginia after a stroke. He had lived in Alexandria since 1972. General Jones, who retired from active duty in 1972, was a battalion commander in World War II and a regimental commander in the Korean War. Then, in 1969 while commanding the 3rd Marine Division in Vietnam, he was wounded in action. During World War II, he became a battalion commander in the 6th Marines of the 2nd Marine Division. In that post, he took part in the bloody battle of Saipan, for which he received the Navy Cross, the Corps's highest award for valor except for the Medal of Honor. His battalion took part in some of the fiercest fighting of the Pacific against the Japanese. In addition to Saipan, he participated in the amphibious invasions of Guadalcanal and Tarawa, where he won the Silver Star for heroism. During the Korean War, he commanded the elite 1st Marines of the 1st Marine Division. He served two tours of duty in the Vietnam War. In 1965 and 1966, he was director of the combat operations center for the Military Systems Command in Saigon. He then took command of the 3rd Marine Division, leading it in combat and during the unit's withdrawal from Vietnam. His military decorations also included three Distinguished Service Medals, a Bronze Star and a Purple Heart. General Jones was born in Joplin, Mo., and raised in Kansas City, Mo. He was a graduate of the University of Kansas and the Naval War College. He received a commission two years after joining the Marine Corps Reserve in 1936 and was called to active duty in 1939. His other assignments included tours as commanding general of the Fleet Marine Forces in the Pacific, director of Marine Corps personnel, legislative assistant to the Marine Corps commandant, and commander of The Basic School at Quantico. In retirement, General Jones was active in the Marine Corps Historical Foundation and served on the board of directors of the Naval War College. He was a member of St. Mary's Catholic Church. Survivors include his wife, Charlotte M. Jones of Alexandria; three children, Carol Hatton of Lawrence, Kan., William K. Jones Jr. of Alexandria and Charles "Chip" Jones, of Richmond; and 10 grandchildren. 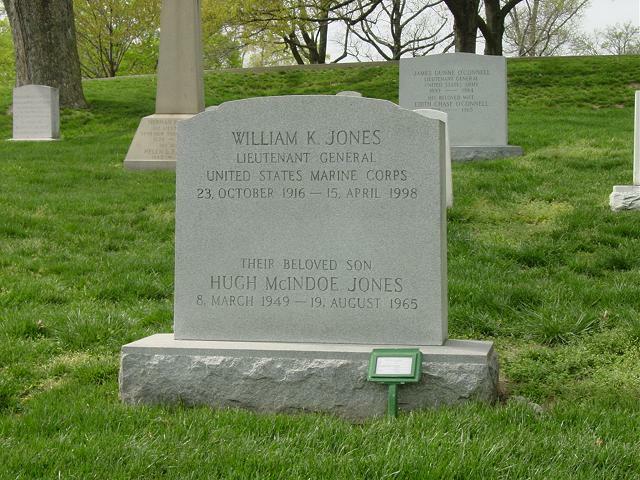 Another son, Hugh M. Jones, died in 1965. On Wednesday, April 15, 1998, at IHS of Northern Virginia, Lieutenant General WILLIAM KENEFICK JONES, USMC (Ret. ), beloved husband of Charlotte M. Jones of Alexandria, VA; loving father of four children, Carol Hatton of Lawrence, KS, William K. Jones, Jr. of Alexandria, VA, Charles V. (Chip) Jones of Richmond, VA and the late Hugh M. (Chief) Jones. Also survived by ten grandchildren. General Jones had a distinguished, 33 year career in the Marine Corps and proudly served his nation through WWII, Korea and Vietnam. In 1972, he retired from active duty as Commanding General Fleet, Marine Force, Pacific. Funeral services, with full military honors, will be held on Tuesday, April 21, 1998 at 1:45 p.m. at Ft. Myer Chapel. Interment in Section 3 of Arlington National Cemetery on April 21, 1998. A reception at the Army Navy Country Club will follow the services. In lieu of flowers, contributions can be made to the Marine Corps Foundation, P.O. Box 3008, Princeton, NJ 08543. Lieutenant General William K. Jones, who earned the Navy Cross and Silver Star Medal during World War II, and retired from active duty September 1, 1972, died April 15, 1998 in Alexandria, Virginia. Born October 23, 1916, in Joplin, Missouri, he completed St. Peter's Elementary School there then attended Southwest High School in Kansas City, Missouri, graduating in 1933. In 1937, he was graduated from the University of Kansas, with an A.B. degree. While in college, he enlisted in the Marine Corps Reserve, April 25, 1936, and attended summer training courses in Platoon Leaders' Class at San Diego, California. He was commissioned a Marine Reserve second lieutenant on January 31, 1938; was assigned to active duty on September 29, 1939; and was integrated into the regular Marine Corps in November, 1940. After completing the Reserve Officers' Course at Quantico, Virginia, in November, 1939, he joined the 1st Battalion, 6th Marines, at San Diego. He remained with the 1st Battalion for almost six years, including all of World War II. In May, 1941, he embarked with the 6th Marines for Iceland as part of the 1st Marine Brigade. He returned to the United States in March, 1942 when the regiment was attached to the 2d Marine Division at San Diego. In the spring of 1942, he was promoted to first lieutenant and, shortly after, to captain. With his unit, Jones was ordered to the Pacific area in October, 1942. He took part in the Guadalcanal campaign as a company executive officer, and later served as a company commander, and battalion executive officer. He was promoted to major in May, 1943. In September, 1943, he became Commanding Officer of the 1st Battalion, and in this capacity took part in four more campaigns: Tarawa, where he earned the Silver Star Medal and a field promotion to lieutenant colonel; Saipan, where he earned the Navy Cross; Tinian; and Okinawa. The Silver Star Medal was awarded him for gallantry in action at Tarawa on the night of November 22-23, 1943, when, his citation states, he exposed himself to withering shellfire to organize and direct a mortar platoon and elements of his headquarters company in a brilliantly executed counterattack against Japanese troops who had broken through his battalion's lines. "… When companies under his command landed out of position on three separate beaches, LtCol. Jones braved heavy enemy mortar, artillery and small-arms fire to proceed from unit to unit and reorganize and direct their disposition in seizing the designated target. Under his competent leadership, the battalion repeatedly turned back Japanese counterattacks during the ensuing two days and, on the night of 16 June, bore the brunt of a hostile tank attack in which 24 Japanese tanks were destroyed…"
Returning to the United States in July, 1945, Jones was stationed at Marine Corps Schools, Quantico, as Head, Tactics and Techniques Section, Basic School, until May, 1947; and Chief of the Infantry Section, Junior School, until June, 1948. Following brief duties in Washington, D.C., he sailed in August, 1948 for Sweden where he served for two years as Assistant Naval Attache and Assistant Naval Attache for Air at the American Embassy in Stockholm. In August, 1950, he reported for duty in the G-3 Section, Division of Plans and Policies, Headquarters Marine Corps. He served there as Head of the Operations Subsection until February, 1952, when he became Head of the Operations and Training Branch. During the latter assignment, he was promoted to colonel in August, 1952. In September, 1953, after serving for three months as Assistant G-3 at Headquarters Marine Corps, Jones arrived in Korea where he served as Assistant Chief of Staff, G-3, 1st Marine Division, for five months. He then commanded the 1st Marine Regiment until his return to the United States in July, 1954. The Bronze Star Medal was awarded him for his service in Korea. During the next four years, he was again stationed at Marine Corps Schools, Quantico, where he served as Assistant Chief of Staff, G-2/G-3, for two years, with additional duty as a member of the Fleet Marine Force Organization and Composition Board, from June, 1956 to January, 1957; and in August, 1956 became Commanding Officer of The Basic School. Leaving Quantico in July, 1958, Jones assumed command of the Recruit Training Regiment, Marine Corps Recruit Depot, Parris Island, South Carolina. He held this command until July, 1960 when he entered the National War College, Newport, Rhode Island. Upon completing the course in Naval Warfare, he was assigned to the Pentagon as Chief, General Operations Division, J-3, Operations Directorate, Joint Staff, Office of the Joint Chiefs of Staff, in July, 1961. He served in this capacity until September, 1962, when he was assigned to Headquarters Marine Corps. On October 1, 1962, he was promoted to brigadier general and appointed Legislative Assistant to the Commandant of the Marine Corps. In March 1964, General Jones assumed command of Force Troops, Fleet Marine Force, Pacific, and Marine Corps Base, Twentynine Palms, California. Ordered to the Far East in December, 1965, he was assigned duty as Director, Combat Operations Center, Headquarters, U.S. Military Assistance Command, Vietnam (MACV). For his services there, he was awarded the Distinguished Service Medal. He was promoted to major general in November, 1966. 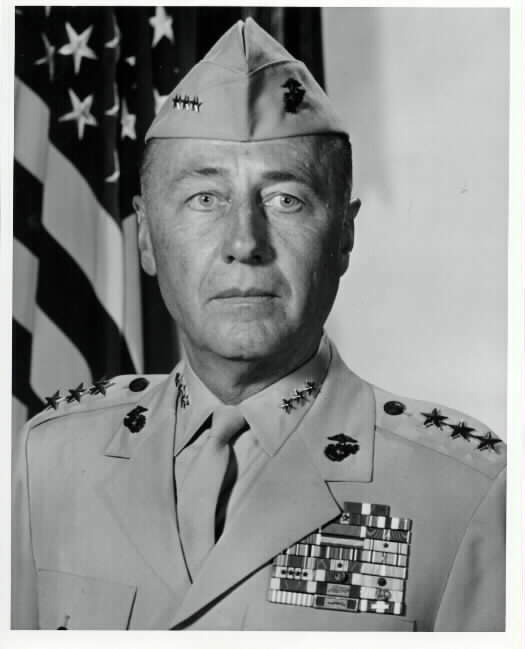 Detached in December, 1966, General Jones returned to the United States and assumed duties as Deputy Director of Personnel, Headquarters Marine Corps. For his service in this capacity from January 1, 1967 until March 1, 1969, he was awarded the Legion of Merit. When reassigned to Vietnam in April, 1969, he assumed command of the 3d Marine Division. Until its redeployment to Okinawa on November 7, 1969, the division conducted extensive combat operations in the Northern I Corps Tactical Zone near the DMZ. Once repositioned upon Okinawa, Jones assumed two duties in addition to remaining the Commanding General of the 3d Marine Division, those being Commanding General of the I Marine Expeditionary Force and Commander, Task Force 79 of the U.S. Seventh Fleet. For exceptionally meritorious service as CG, 3d Marine Division, in the Republic of Vietnam, and subsequently as Commanding General, I Marine Expeditionary Force on Okinawa, from April, 1969 until April, 1970, he was awarded a Gold Star in lieu of a second Distinguished Service Medal. The Vietnamese government awarded him the National Order of Vietnam, 4th Class, the Vietnam Cross of Gallantry, and the Chuong My-1st Class Medal. Upon his return to the United States, he was assigned duty as Special Assistant to the Chief of Staff at Headquarters Marine Corps. Nominated for three-star rank by President Nixon, his nomination was confirmed by the Senate, May 12, 1970. After his promotion to lieutenant general, July 1, 1970, he assumed his last duty assignment as Commanding General, Fleet Marine Force, Pacific, and served in this capacity until he retired from active duty, September 1, 1972. He was awarded a third award of the Distinguished Service Medal for his service during this assignment. A complete list of his medals and decorations include: the Navy Cross; three awards of the Distinguished Service Medal; the Silver Star Medal; the Legion of Merit; the Bronze Star Medal; the Purple Heart; the Presidential Unit Citation; the American Defense Service Medal with Base clasp; the European-African-Middle Eastern Campaign Medal; the Asiatic-Pacific Campaign Medal with one silver star in lieu of five bronze stars; the American Campaign Medal; the World War II Victory Medal; the National Defense Service Medal with one bronze star; the Korean Service Medal; the Vietnam Service Medal with three bronze stars; the National Order of Vietnam, 4th Class; the ULCHI (Korean) Medal; the National Order of Vietnam, 5th Class; the Vietnam Cross of Gallantry Medal; the Chuong My-1st Class Medal of Vietnam; the United Nations Service Medal; and the Republic of Vietnam Campaign Medal with Device. Reserve Officers' Course at Quantico, in November 1939, he joined the 1st Battalion, 6th Marines, (1/6) with which he was to serve for nearly 6 years, throughout the Pacific War. His initial assignment was as a platoon leader with Company B, 1/6, which was then a component of the 1st Provisional Marine Brigade. In May 1941, the unit was deployed to Iceland to help defend that country from the threats of a Nazi invasion. When he returned to the States in March 1942, 1stLt and then Capt Jones became first the 1/6 adjutant and battalion personnel officer and, later, its operations officer. It was in these billets that he participated in the Guadalcanal operation. As a major, he took command of 1/6 and led it in the amphibious assault of Tarawa on 20 November 1943. During rehearsals for Tarawa, 1/6 practiced landing from rubber boats, thus earning Jones the title of "Admiral of the Condom Fleet." For the actual landing, 1/6 Marines were carried toward their assigned beach by LCVPs towing their rubber boats. At the reefline, they transferred to the boats and began a 1,000-yard paddle to Green Beach. Once ashore, Jones' Marines began a drive down the island under heavy enemy fire. For conspicuous gallantry and intrepidity on the night of 22-23 November, Jones was awarded the Silver Star Medal. When two of his companies became separated by the first of several Japanese night attacks, he organized a reserve from his mortar platoon and headquarter and personally led a "brilliantly executed" counterattack ejecting the enemy and closing the gap in his lines. Maj Jones earned not only the Silver Star in the fight for Tarawa, but also a field promotion to lieutenant colonel before he was 27 and thus reputedly became the youngest officer of that rank in the Marine Corps. Saipan was the next campaign. Jones' battalion was subject to intense fire during the landing on 15 June, and three of his companies landed out of position on three separate beaches. LtCol Jones proceeded from unit to unit to reorganize and redirect their disposition. On the night of 16 June his battalion bore the brunt of a Japanese attack in which 24 Japanese tanks were destroyed. After 25 days of bitter fighting, Saipan was secured and preparations began for the 24 July shore-to-shore landing on adjacent island of Tinian. For his heroism on both Saipan and Tinian, LtCol Jones was awarded the Navy Cross. Later on, LtCol Jones also participated in the Okinawa campaign when the 2d Marine Division was deployed to the island from Saipan. LtCol Jones returned to the States in July 1945 for a series of postwar command and staff assignments. In this period he wrote a series of articles for Marine Corps Gazette under the pseudonym of "Base Plate McGurk—Company Officer." In the foreword to a published paperback containing his articles, which essentially were tips for young company-grade officers on such matters a morale, discipline, leadership, and esprit de corps, he wrote: "Napoleon once said 'There is no strength without skill.' To me, this means that even though we know the principles, which are so ably set forth in our field manuals, this knowledge is of little value unless we also know how to put these principles into effect. Therefore, this book is concerned with 'the ways and means,' the object being, of course, not to set forth the way or the means but rather to show a way or a means." What he wrote in the 1940s still holds great value for the junior officers of today's Marine Corps. He was promoted to colonel in 1952 and was assigned to command of the 1st Marines in Korea in early 1954. In December 1965, as a brigadier general, he was sent to his third war. His assignment was duty as director of the Combat Operations Center of the U.S. Military Assistance Command in Vietnam. He was promoted to major general in November 1966 and returned to the States for duty at HQMC. When reassigned to Vietnam, he assume command of the 3d Marine Division. In 1970, he received his third star and became commanding general of Fleet Marine Force, Pacific. He retired in September 1972 after 33 years of continuous active service. Charlotte McIndoe Jones, 84, a former president of the Marine Corps Officers' Wives Club in Alexandria and volunteer for the American Red Cross, died September 20, 2005, at her home in Alexandria. She had congestive heart failure. Mrs. Jones was born in Joplin, Missouri, and raised in Kansas City, Mo. She attended the old Bradford College in Haverhill, Mass., and the University of Missouri. Her first husband, Army Captain Lee J. Talbott Jr., died in the battle of Leyte Gulf in the Pacific in 1944. She married William K. Jones, a Marine Corps officer, in 1945. She accompanied him on his assignments before they settled in the Washington area in 1960. He retired as a lieutenant general. He died in 1998. A son from her second marriage, Hugh M. Jones, died in a car accident in 1965. Survivors include a daughter from her first marriage, Carol Hatton of Lawrence, Kan.; two sons from her second marriage, retired Marine Corps Lt. Col. William K. Jones Jr. of Alexandria and Charles "Chip" Jones of Richmond; 10 grandchildren; and four great-grandchildren.